Description: Work is one of the most dominant and unavoidable realities of life. Though experiences of work vary tremendously, many Christians share a common struggle of having to live in seemingly bifurcated spheres of work and faith. Beginning with the conviction that Christian faith permeates all aspects of life, Joshua Sweeden explores Christian understandings of ""good work"" in relationship to ethics, community practice, and ecclesial witness. 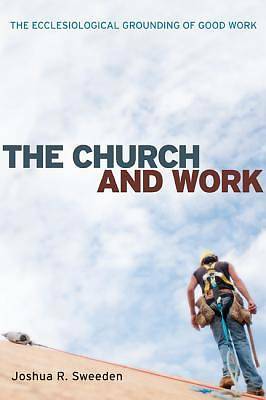 In The Church and Work, Sweeden provides a substantial contribution to the theological conversation about work by proposing an ecclesiological grounding for good work. He argues that many of the prominent theological proposals for good work are too abstract from context and demonstrates how the church can be understood as generative for both the theology and practice of good work. This needed ecclesiological development takes seriously the role of context in the ongoing discernment of good work and specifically explores how ecclesial life and practice shape and inform good work. Christian understandings of good work are inconceivable without the church. Accordingly, the church is not simply the recipient and a dispenser of a theology of work, but the locus of its development.